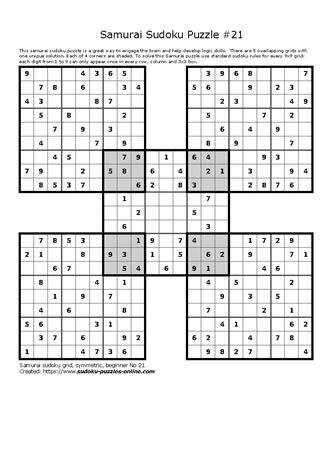 Basic Sudoku puzzles (one 9x9 grid) have various levels of difficulty (for example: very easy, easy, moderate, hard, challenging). Samurai Sudoku puzzles also share similar degrees of difficulty (beginner/easy, confirmed/moderate, advanced/hard). This Samurai Sudoku puzzle is rated beginner, or easy. But, easy is relative since this brain teaser is already starting at a different level of challenge when compared to the basic Sudoku puzzle: there are five 9x9 grids, with one center grid interconnected with the other four grids. Use knowledge and understanding of Sudoku's basic rules to solve for this puzzle's unique solution. Basic Rules include: a) use only the digits from 1 to 9; b) digits can only appear once in each row, and once in each column; c) digits can only appear once in each 3x3 grid. Remember that the shaded areas are shared 3x3 grids, where attention to detail and following logical reasoning supports the puzzle solver.